I offer sea trout fishing trips on the beautiful Moy Estuary. 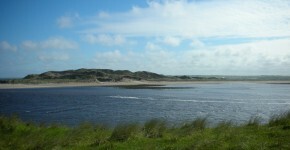 I am based at the Quay, Ballina, Co. Mayo but my hunting ground is the mouth of the world famous river Moy. I have over thirty years’ experience fishing for sea trout and dealing with angling tourism in the Moy Valley region in the North West of Ireland. I still enjoy that great buzz, expectation with every cast! View Judd’s latest blog posts here! I offer two ways to catch sea trout, bait fishing and fly fishing. Bait fishing from my cabin cruiser is the most popular method. This method is great for the average angler looking for good day out with a little extra comfort. 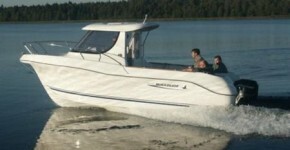 The Quicksilver 640 Pilothouse cabin cruiser gives plenty of space for fishing, can cater for four anglers and offers better protection from the elements if required. Salt water fly fishing from my lake boat is a new development. This method is great for experienced anglers looking to catch sea trout on the fly. Catching sea trout on the fly is fantastic and this method has seen a remarkable surge in interest. Over the years I have developed a range of flies and lures for the salt water and I find this aspect of the business very fulfilling. I can cater for 2 anglers using this method. Both methods come with an experience guide to show you the hottest fishing spots and tackle is provided if required. The sea trout season runs from the 17th April to the 10th October. 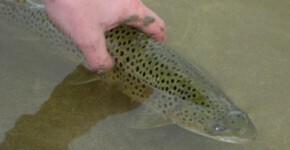 Sea trout range in size from ½ to 4 lbs. A state fishing licence is required and this can be obtained from the many tackle shops in Ballina or you can book online at salmonlicences.ie. If you are planning a visit to this area why not join me on my boat for a day on the wonderful estuary and enjoy a great experience. Moy Estuary Sea Trout 2019.